Advantages: Arguably the best Me 262 in any scale and Trumpeter's best release to date; outline and appearance conform to published plans and photos; high quality mouldings; high level of detail in most areas including two full engines, gun bay, cockpit and fuselage interior; sensible engineering resulting in a buildable kit; optional position slats, flaps and flying surfaces (but no metal hinges - huzzah! ); very impressive, appropriate and subtle surface features including finely recessed panel lines, fasteners and even visible screw head slot detail! 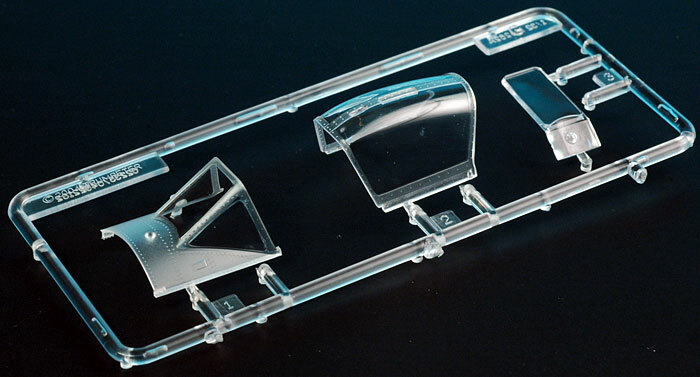 ; thin, clear and accurate transparent parts; options included two gun nose, RATO packs and different styles of nose wheel. Disadvantages: Some extra work will be required to display engines; rubber tyres; still has Trumpeter's typically peculiar instrument panel configuration; questionable colour callouts, especially for interior parts. Trumpeter has come of age. 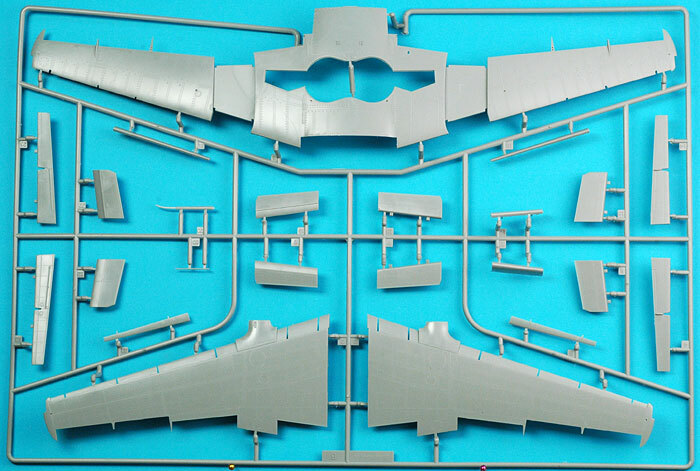 On seeing early production sprues of Trumpeter's 1/32 scale Messerschmitt Me 262A-1a at the recent IPMS USA Nationals, my first impressions were very favourable. The standard production kit arrived on my doorstep this morning. The contents look even more impressive on closer examination. 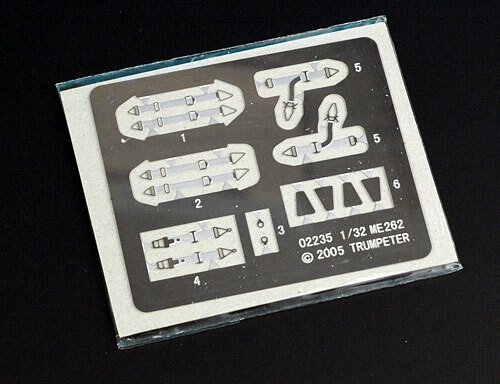 Trumpeter's 1/32 scale Me 262A-1a comprises 355 parts in light grey and clear injection molded plastic; four rubber tyres; four white metal cast undercarriage legs; 14 photo-etched parts and a small acetate film for instruments. Surface detail is the most subtle I have yet seen on any Trumpeter kit, and in fact rivals the best on any kit produced to date. 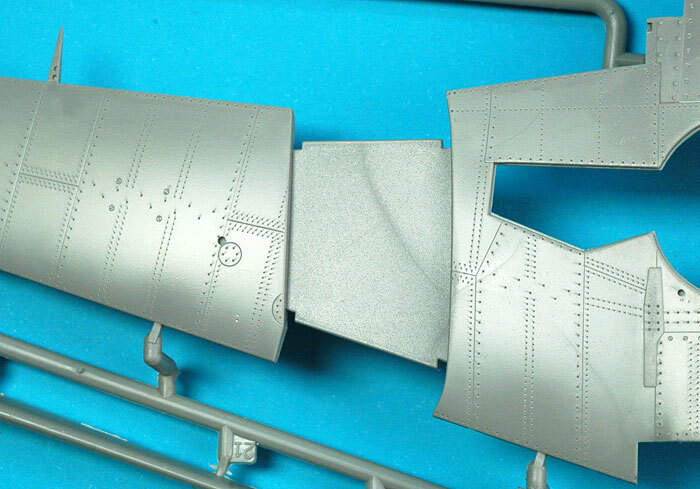 Panel lines are very finely recessed, and carefully selected rows of rivets in places. Subtle details such as fasteners and even slots in the heads of screws (!) are beautifully depicted too. Ejector pin circles and sink marks are admirably few. All control surfaces, including slats and flaps, are separate. I was overjoyed to see that these are connected by fixed plastic tabs - no wrestling with pliers and steel hinges on this model! It will be a relatively simple matter to reposition the tabs to alter the position of the control surfaces on the finished model. Speaking of control surfaces, the rudder seems to be the later style with the small navigation light near the bottom corner. Early Me 262s had a larger navigation light taking up the bottom corner of the rudder. If you want to depict the earlier version, it would not be difficult to cut out the small grey plastic panel and shape some clear styrene to suit. Clear parts are very thin and free of distortion. 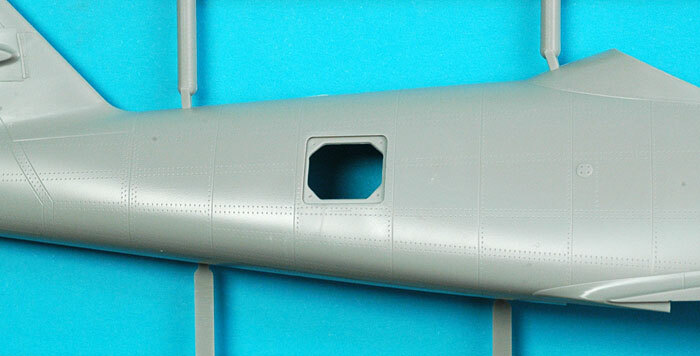 I like that the windscreen is moulded onto a section of the forward fuselage deck. This will reduce the risk of smearing the windscreen with glue. The armoured glass panel is supplied as a separate part. Once again the instrument panel is offered as a clear part, yet the lenses of the instruments are hollow. The kit features two full Jumo turbojets. One set of sprues is in grey plastic, and the second is in clear. The Jumos are very well detailed straight from the box, but the determined superdetailer will probably add some extra wiring and plumbing if the engines are destined for display. Strangely, the engine nacelles are not supplied with separate parts for the forward or lower access panels, so a little careful attention with a hobby blade will be required if you want to leave the covers off. Interior detail is very thorough. Not satisfied with presenting a nicely detailed cockpit and cannon bay, Trumpeter has also supplied a well-done radio and mount, gyro compass and oxygen bottles for the inside of the rear fuselage. The radio hatch is separate too, so when the fuselage halves are joined you will still be able to prove that you have done all that extra work! 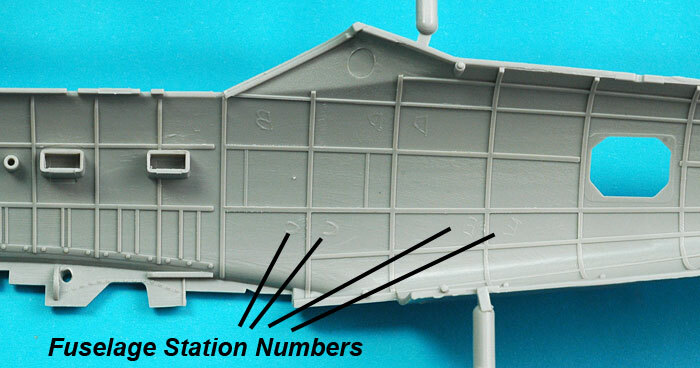 Structural detail is also present on the interior of the fuselage halves, along with a unique insight into the planning of the kit - raised fuselage station numbers from the masters still visible on the moulds. 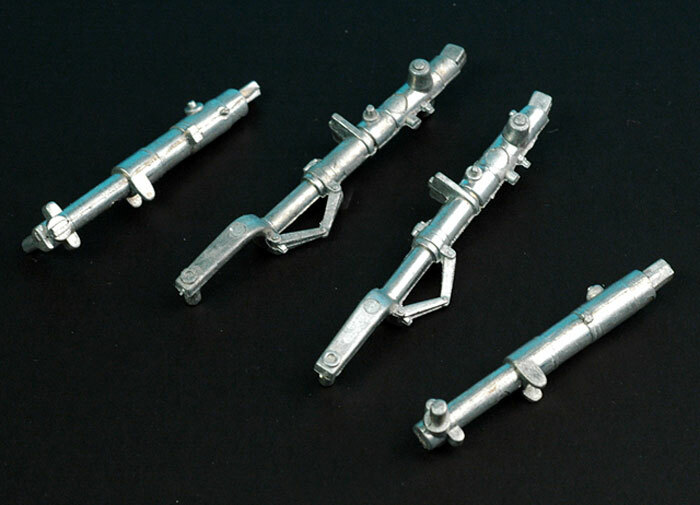 Trumpeter has supplied landing gear legs in both white metal and plastic, leaving the choice to the modeller. The gear is very simply broken down. In fact, the forward landing gear is a single part, including the oleo scissors moulded/cast in place. Note that many Me 262s did not have the oleo scissors on the forward gear leg. Check your references, but it will be a simple matter to cut off the scissors if they were not present on the particular subject you are building. 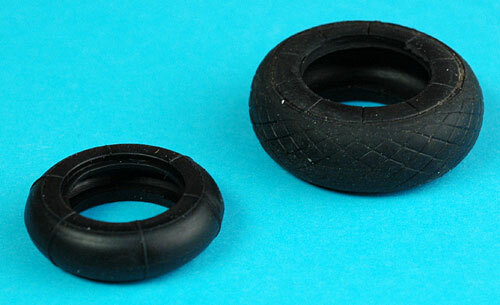 In common with most of Trumpeter's earlier releases, tyres are rubber. This will not please some modellers (myself included), but the seam lines are small and detail is good. We are also offered the choice of two different nose wheels. Trumpeter's research is more thorough than mine, in that the two wheels are different widths. I had thought that they were just different tread patterns. Multimedia content is further boosted with a set of photo-etched harnesses. 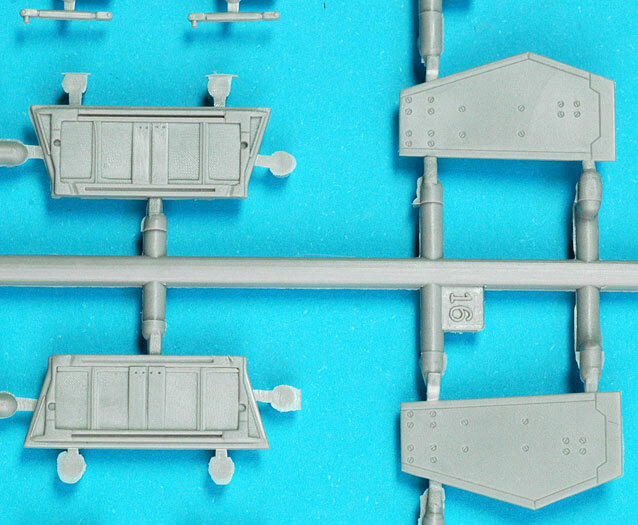 Like the rest of the kit, these parts are well detailed but should be simple to use, as the buckles and mounts are integrated with the straps. Further options include the choice of a two-gun or four-gun forward cowl, and RATO packs for the bottom of the fuselage. Nose weight is not supplied but it will certainly be required. Fortunately there is plenty of room under the forward gun cowl. Two sets of markings are supplied - red 4 from JG 7 and Walter Nowotny's White 8. 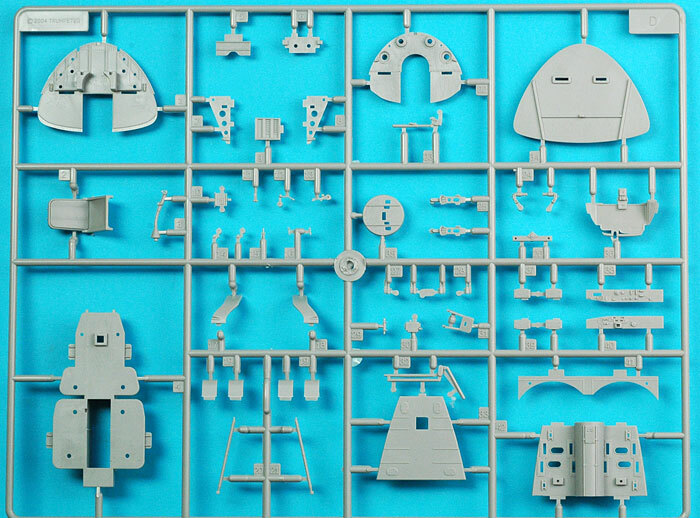 The profile and dimensions of the kit's main parts compare closely with scaled-up plans from Eagle Editions' "Stormbird Colors". 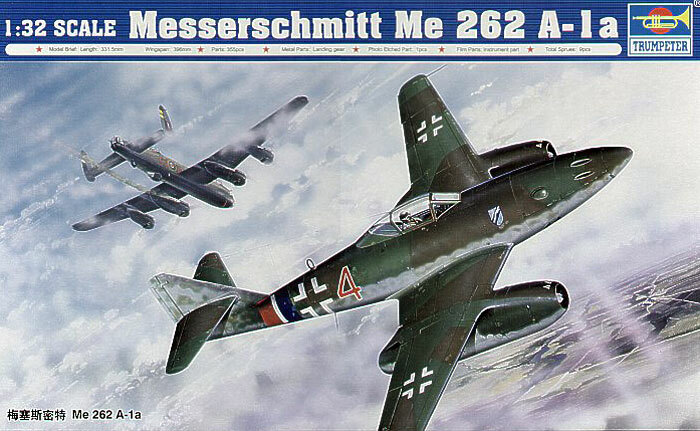 In my opinion, this is the finest Messerschmitt Me 262 kit available in any scale. I also believe that it is clearly Trumpeter's best release to date. There are two aspects of this kit that I find especially pleasing, as they both suggest that Trumpeter is maturing into a quality kit manufacturer. Firstly, Trumpeter has clearly done their homework before they started mastering the parts. The kit is well researched and accurate in outline and, as far as I can tell so far, in detail. Secondly, it appears that Trumpeter has responded to comments about earlier releases in terms of surface features (heavy panel lines and deep rivets), gimmicks such as hinges, and production planning factors including the location and number of ejector pin marks. This kit is the epitome of subtle surface detail and sensible parts breakdown. Trumpeter's offerings have always been ambitious and often impressive due to sheer size, but their Me 262A-1a seems more thoroughly planned and more carefully executed than many earlier releases. I get the impression that someone really wanted to get this one right, and they have. The modeller has been taken into greater consideration too. 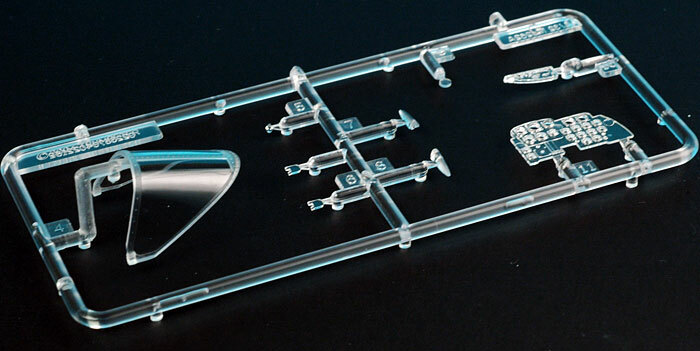 This kit is more simply engineered - for example, plastic tabs versus metal hinges for the control surfaces - yet still offers plenty of useful detail and options. 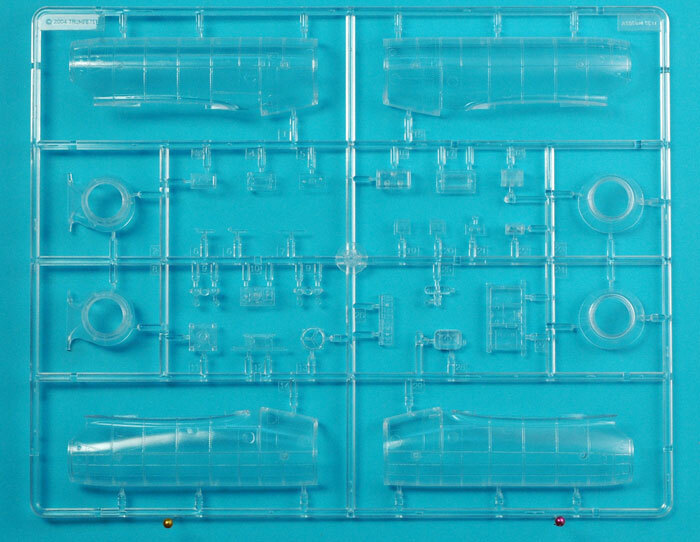 Of course, the proof of this pudding will be in the building, but I can't see too many construction challenges lurking in the sprues, notwithstanding the high parts count. Trumpeter's 1/32 scale Messerschmitt Me 262A-1a is a state-of-the-art model of an important subject. If you are a large-scale aircraft builder or a Luftwaffe aficionado in general, you are going to love this kit.